Why do cats scratch objects? There are several reasons for us to ponder. One, maybe they are just sharpening their claws. It turns out that this is only a secondary reason. Research suggest the major reason for this behavior is communication. Cats who have scratched a group of trees is telling other cats out there that the territory is already owned. 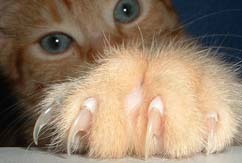 There are numerous little scent glands within the cat’s paws that allow the cat to scratch their scent into their territorial scratching. Now we understand this concept, Cats also scratch as a combination of exercise and release. It relieves stress for them. Scratching works the muscles located in their front quadrant while giving them a good release of tension. As a good parent, one should consider purchasing a cat scratching post for your home to make your little feline friends “happy cats”.